Accessed in the Component panel of the Contents pane by clicking the coordinate system picker button for the component. Modern formats designed to store spatial data will automatically specify the coordinate system to be used for the data they provide. Data from such sources will import seamlessly into Manifold with the initial coordinate system automatically assigned. In the Contents pane the coordinate system for the component will appear in black text, indicating it has been assigned and the component is ready to go. If the coordinate system is shown in red color, we must click the coordinate system picker button and choose Assign Initial Coordinate System. Manifold shows the coordinate system in black color, as in the Latitude / Longitude coordinate system seen above at left, when the component has been created with coordinate system information or if it has been imported from a format that specifies the coordinate system to use. When a component has been created without specifying the coordinate system or it has been imported from a format that does not specify projection information, Manifold will show the default Pseudo Mercator coordinate system as a placeholder in red color. When the coordinate system appears in red text that warns us the component was imported from a source that failed to specify the initial coordinate system. That happens when acquiring data from older formats or from sources, such as CAD or photography formats, not designed to store spatial data. Manifold will assign a placeholder coordinate system, the default Pseudo-Mercator system, for the component to use until we manually can assign the correct initial coordinate system. The red text tells us we must assign the initial coordinate system manually by using the Assign Initial Coordinate System command. Until we use that command to assign the initial coordinate system the read-out for that component will use red text. Once we assign the initial coordinate system the read-out will switch to black text. Edit Coordinate System - This launches the Coordinate System dialog to enable choosing any one of thousands of coordinate systems. Choose one of the listed favorites - By default, Manifold always provides Latitude / Longitude and Pseudo Mercator as default favorites. If other coordinate systems have been added to our favorites, those also will appear in the list. Edit Favorites - Launch the Favorites dialog to enable us to add a new favorite if we like. This is a convenience that allows us to right away add another coordinate system that we know we will want as a favorite. 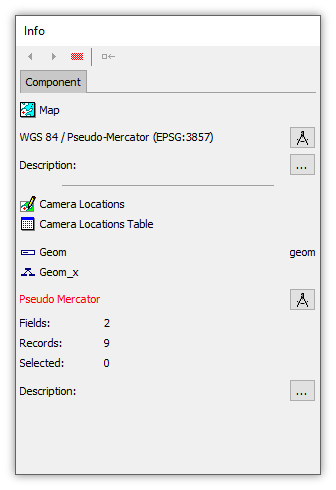 See the Coordinate System topic for details on using that dialog. When we must use this command, we only use it once after initial import or linking of a component. After it is used once the command will no longer appear. If we make an error applying this command, we can repair the error by using the Repair Initial Coordinate System command that thereafter will be available. For a step-by-step illustrated example using the Assign Initial Coordinate System command, see the Example: Assign Initial Coordinate System topic. Important: If we import or link data only from modern formats designed for spatial data storage we might never see this command or need to use it. It appears as an option only for those components brought into a project that Manifold knows were imported or linked from formats that failed to specify the initial coordinate system. No changes to data - Assigning an initial coordinate system does not change the coordinate numbers embedded in a drawing's geometry and it does not change pixels in images. It only specifies the correct coordinate system property to be associated with that drawing or image so the data they contain makes sense as intended. Knowing what to assign - People publish projected data all the time in spatially brain-dead formats which do not convey projection information and then they fail to tell users what projection they used. The red text along with a choice limited to Assign Initial Coordinate System warns us that the source of the data failed to specify the coordinate system,, but if we do not know from other means (such as reading a description of the data on a web site) what coordinate system should be used we cannot manually assign it using the command. We might get lucky, try Latitude / Longitude, and discover the data looks OK against a "known good" layer like Bing. But that's fake luck in many circumstances because we will not know if a default datum choice like WGS84 is the right one, and not NAD27 or some other datum that also produce a visually close alignment. The best approach is to sharpen our detective skills, to carefully search the website from which we downloaded the data and to carefully review any accompanying metadata files to see if we can find an authoritative statement of what coordinate system was used. Keeping the careless at bay - People who do not read instructions will often misuse Assign Initial Coordinate System by thinking it is used to change a coordinate system that has already has been correctly assigned. They want to change projection from what they think is Pseudo Mercator to some local projection, they click on the coordinate system picker button and the only choice they see enabled is Assign Initial Coordinate System, with the Change Coordinate System choice disabled. So they choose Assign Initial Coordinate System and proceed to choose the projection they want. The result is total chaos because first, the initial coordinate system has now been wrongly assigned, and second, the red text that was used to warn that the coordinate system was probably wrong will now be replaced with black text and the coordinate system that they specified. Instead of changing the projection they take a perfectly good image or drawing that was ready to be made useful through intelligent use of Assign Initial Coordinate System, and they assign the wrong coordinate system to that data. Prevent this problem by ensuring all people who you allow to work with your data know that when they see red text and the sole choice of Assign Initial Coordinate System they should not do anything further before checking with you. Forbid them from using Assign Initial Coordinate System until you review their work and have verified they can be trusted not to misuse the command. Synonyms - The terms projection and coordinate system are used as interchangeable synonyms in Manifold. Cartographers favor the term projection while programmers seem to prefer coordinate system. This documentation uses the two terms interchangeably, with the term projection tending to be used more in GIS or display contexts and the term coordinate system tending to be used more when discussing programming, SQL or standards. Trust Manifold - If the coordinate system readout for a component appears in red text in the Contents pane and Manifold allows only the choice of Assign Initial Coordinate System from the coordinate system picker button, we should not argue with the system, no matter how sure we are that the data that was imported or linked came with a specification of initial coordinate system. Believe the initial coordinate system was not specified and use the command to specify it manually. Data that is thought to contain coordinate system info frequently does not. People forget to include necessary files, files get damaged when edited by the wrong software (see the commentary on killing GeoTIFFs in the TIF topic) and sometimes people publish data assuming everybody on Earth will by default use exactly the same coordinate system they do, so they do not include all info required for those who do not base all thought upon Universal Transverse Mercator Zone 42 (S).